I made this for the deconstructed sketch challenge #53. I just got this paper pack in the mail and it wasn't quite what I was expecting but it's still pretty cute and goes well with the crab & company set. ps-thanks for telling me about feline playful's blog! That crab is adorable! Perfect for a summer birthday!! This is super cute! Love the crab and that fun paper! Thanks for using this week's sketch! PRECIOUS!!! Love the DP and that image. "Snappy" sentiment too! Love it. oh my goodness this is just way too cute! thanks so much for stopping by my blog last week and taking the time to write such a kind comment! I would be honored if you stopped by again sometime or even signed up to follow and i would do the same! thanks again! Oh my gosh Gayle, your card is darling! 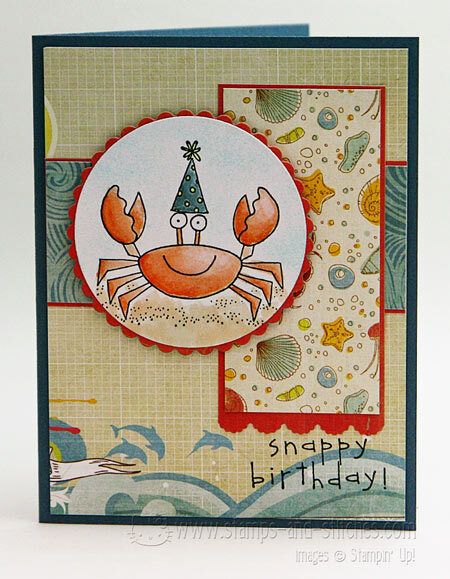 Love the image and the way you colored him, and your designer paper just completes your card! Super cute! Very cute! I love the crab. The paper is perfect for the stamp. Love it!